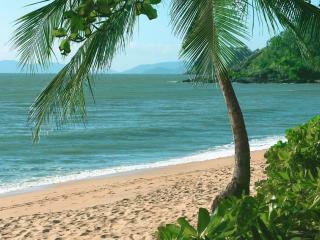 Cairns is the gateway to Tropical North Queensland. The Cairns Northern Beaches, Port Douglas and The Daintree Rainforest are to the north while the Atherton Tablelands are to the west surrounded by rainforests. Below Cairns you will find mountainous countryside with beautiful crater lakes and waterfalls. And looking to the east lies the magnificent Great Barrier Reef - past the calm water of Trinity Bay and beyond to the Coral Sea. 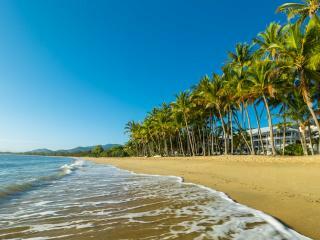 All travel to Far North Queensland is directed through Cairns and it has now become Australia's 16th largest city. Browse Cairns accommodation for the perfect holiday in the tropics. Cairns tourism has a major part in the local economy. Cairns is in the top 5 destinations for international visitors to Australia due to its ideal location right on the reef and close proximity to Mission Beach, Palm Cove and Port Douglas. 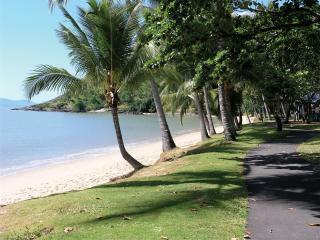 There is also a wide range of Cairns Beaches accommodation in the areas north of the city. Travellers can find luxury resorts in Trinity Beach, Kewarra Beach, Palm Cove and Yorkeys Knob, all the way to Port Douglas and beyond. Some of the main activities in Cairns involve the many small theme parks - observing and interacting with nature and the animals. The Skyrail Rainforest Cableway is a great way to see the tropics, perched high up in a cable car you can view the entire region. There are several places to see koalas, kangaroos, snakes and crocodiles and interact with local aborigines and their ancient traditions. Be sure not to miss the simple luxury of nearby Palm Cove accommodation and the stylish sophistication of Port Douglas accommodation. Holiday cruises also frequent the area, stopping at many beautiful Islands and beaches up and down the coast and on the Great Barrier Reef. Cairns holidays would not be complete with out a trip down the Esplanade. 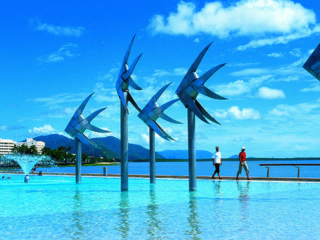 In warm weather locals and tourists alike use the Cairns Esplanade Lagoon. It is a massive pool in the shape of Queensland with water fountains, shallow areas and life guards patrolling during the day. At night the Cairns Esplanade comes alive with hundreds of people coming out from their hotels to dine at the restaurants and eateries that abound in this area. Huge savings can be found when purchasing Cairns holiday packages. All kinds of extras can be bundled into holiday packages like transfers, meals, day spa vouchers, tours and even flights to help make holidays more affordable. Staying at the most expensive resorts and hotels becomes possible when purchasing accommodation, transfers and tours all at the same time. A sample of our of cairns holiday packages can be found on the right or click the link to view hundreds of specials for North Queensland and the Great Barrier Reef.